The Canon IR-C355i is a multi-function laser printer that efficiently produces professional-quality colour documents. It incorporates a print, scan and copy function, and an optional fax function is also offered. This printer is designed for an office or small-business environment that needs to print a high volume of documents up to A4 size. The machine’s built-in and optional features make it easy to manage accessibility and security. It prints easily from PCs, laptops and smart devices. Several energy-saving features save money and protect the environment. The measurements of the Canon IR-C355i are 511 x 651 x 639mm, and its grey and black colour means that it will fit in with most office decor schemes. A roomy 25.7-cm responsive touchscreen makes it easy to navigate the machine and check statuses. The printer connects via Ethernet, USB or Wi-Fi, and allows for printing from smart devices. The print resolution is 1200 x 1200dpi, and the print speed is 35 pages per minute. A 550-sheet paper tray is supplemented by a 100-sheet manual paper feed, and output can be increased with the purchase of additional paper trays. The size of the printer gives the option of placing it on a desktop or leaving it free standing. 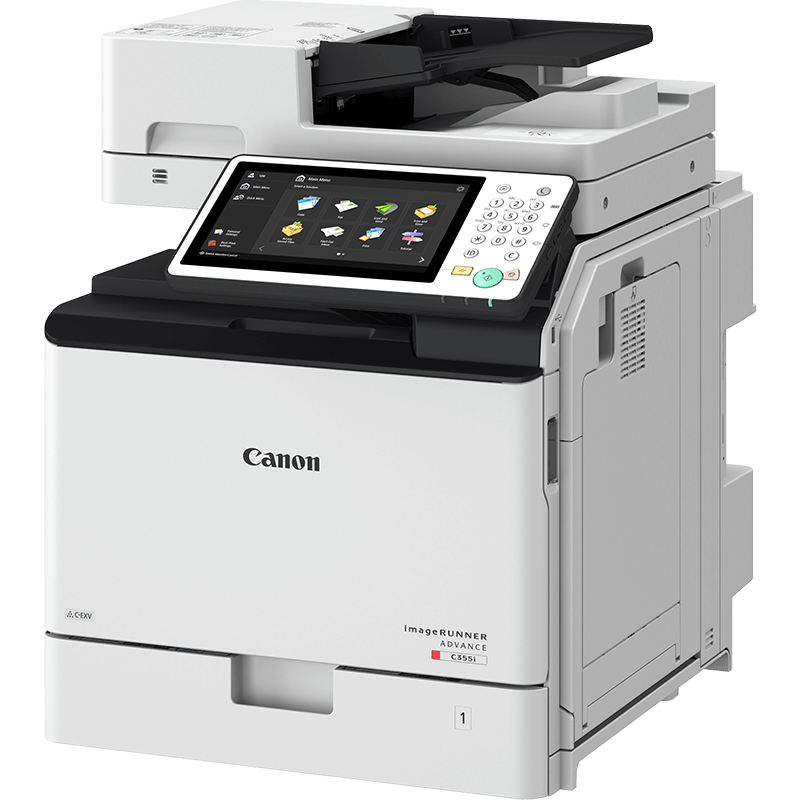 The Energy Star-certified Canon IR-C355i includes energy-saving features to reduce printing costs and protect the environment. Access to the Canon IR-C355i can be easily controlled using smart-user authentication without any negative impact on productivity. Confidential documents are protected with a range of standard and optional security features. It prints double-sided automatically and has a staple-finishing option. The Canon IR-C355i prints documents no larger than A4 and the fax function is optional so should be factored into the price before purchasing if this a feature you’ll be wanting to use.